The Total Outdoorsman Manual is the ultimate guide book for the outdoors enthusiast, packed with hundreds of practical tips and techniques from T. Edward Nickens and the experts at Field & Stream magazine, that is guaranteed to improve your hunting, fishing, camping and survival skills. This special edition, issued for the 10th anniversary of the Total Outdoorsman Challenge has all the content readers love, plus 50 new activities that can help anyone compete in the Challenge. With practical information for both the beginner and advanced outdoorsman, the book is an authoritative, comprehensive, and entertaining guide that will enable anyone to master the outdoors and hunt, fish, and camp like an expert. 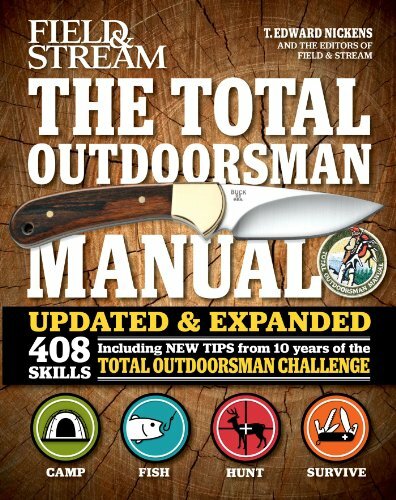 The 10th anniversary edition includes a chapter of new tricks and skills from Total Outdoorsman Challenge contestants. HUNT BETTER How to track a buck, make the toughest shots, master bowhunting and knife skills, and haul, butcher, and cook wild game. FISH SMARTER Advice on the best techniques for flyfishing, baitcasting, and spinning, as well as surefire ways to get the most out of your motorboat, canoe, or kayak. SURVIVE ANYTHING Whether you fall through thick ice, are swept away by a raging river, or have a stare down with an angry bear, these skills means the difference between life and death. CAMP ANYWHERE Tested and proven expert tips to help you stay warm, eat well, and build a fire in any situation in record time. For more than 100 years, Field & Stream magazine has provided expert advice on every aspect of the outdoor life, including hunting, fishing, conservation, and wilderness survival. The magazine’s annual Total Outdoorsman issue is one of its most popular, read by over nine million sporting enthusiasts. The Total Outdoorsman Challenge brings together avid hunters and anglers from around the country to demonstrate their skills and compete for big bucks and bigger glory. Winners are all-around hunters, fishermen, and survivors with a flair for problem-solving and the skills to prevail.